KEEP YOUR BUSINESS MOVING WITH A MOBILE YARD RAMP! Solve Needs International Yard Ramps simplify loading and unloading of trucks, railcars, ships, docks and virtually every other carrier imaginable from ground level. We have the most sizes & capacities available anywhere and our Yard Ramps are proudly made in America! Design your Yard Ramp or use one of the above links to find your desired type of yard ramp and an exact model number. 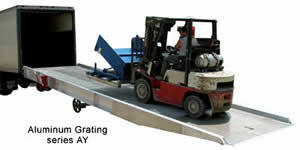 Used Yard Ramps - Caution: We do not deal in used yard ramps because of liability. You never know if a previous owner may have overloaded it causing minute cracks leading to eventual catastrophic failure resulting in injury and possible death. Capacities: 15,000 / 20,000 / 25,000 and 30,000 lbs. Widths: overall 73" with usable of 66" and 85" with usable of 78"
Service Height Range 45" to 62"
YR-HDRL 42" high handrails w/21" midrail 12 per ft.